Do you struggle with falling asleep? Do you wake up multiple times throughout the night, looking drearier-eyed in the morning than you did the night before? Do you often get mistaken for a tranquilized raccoon? You're not alone! An estimated 10% of people suffer from a chronic insomnia disorder and one in three people exhibit brief symptoms of insomnia. 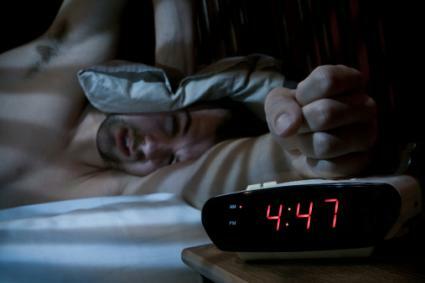 If you've gone through yet another sleepless night, you'll likely identify with some of these all-too-common symptoms and experiences. When you're lying wide awake in the dead silence of the night, you become acutely aware of the tiniest and eeriest of sounds. You hear the rabid growling of what sounds like a wild, starving animal, only to figure out that it's just your stomach. Rumble. Rumble. During the day, you normally wouldn't go more than a few hours without eating something. When you realize that your midnight snack was a full four hours ago, your intense craving for another fatty carbo-load can hit you like a "can't possibly go back to sleep" ton of delicious bricks. The leftover fried chicken beckons. ... I'll still be able to get three hours and 13 minutes of sleep before I have to start my day. Checking the bedside clock every few minutes to calculate exactly how much time you've got before the alarm startles you into an utterly bewildered state is an old pastime every insomniac is familiar with. Your elementary school math teacher would be so proud to know you're putting those arithmetic skills to good use. You listened to all the advice. You got away from the TV, computer and smartphone a full hour before bedtime. You sipped on a warm glass of milk. You made your bedroom a dark and quiet environment. You did it all and you're exhausted. It's time to sleep. Your body is aching with fatigue. Your brain, on the other hand, has entirely different plans. You're going to flip through your stream of consciousness with questions that demand immediate answering. Like if plastic is made from oil, and oil is made from decomposed organic material, then how much actual ancient dinosaur is in a fake plastic dinosaur toy? Sleep-deprived minds want to know. Success! You finally managed to fall asleep at an almost reasonable hour, only to wake back up before the sun peeks its shining bright beacon of light above the horizon. It's not even 5:00 am yet. Do you struggle with trying to sneak in an extra hour or two of sleep, knowing full well it'll likely take you that hour or two to fall back asleep, anyway? Or do you just crawl out of bed for an early start, knowing full well that you'll end up lumbering through your day like an exhausted zombie? There are no winners here. In addition to the physical impact of severe sleep deprivation, the psychological effects can be even more disastrous. Your response time slows, your attention span shrinks, your short term memory suffers, your speech slurs, and your thought processes become fragmented. As you bumble away, struggling to survive your 9-to-5, you're not entirely aware of your surroundings or anything that you're doing. And by the time you get home from work, you have no specific memory of anything from the last 12 hours. You were just going through the motions, a routine you'll surely repeat tomorrow. Take comfort in knowing that if you are reading this at 3 am and your mind is still running at a mile a minute, you're not the only one counting sheep and wondering why this endless parade is leaping over a short fence in the middle of a nondescript field. The good news is that when you start to crash tomorrow morning, you'll still be able to wake up without coffee and be a reasonably productive member of society. You just might not remember it.